This week’s season opener on Florida’s Harris Chain is looking like a game of musical chairs for the Bassmaster Elite Series field. If he believes there’s a benefit to hitting a majority of the chain’s 10 lakes, an Elite Series pro will be very busy running from lake to lake to lake. When the music stops — when time runs out, that is — he’ll be successful if he’s left holding a good spot. Better to eliminate several of those lakes right away, said Elite Series pro Shaw Grigsby as he practiced Monday for the March 10-13 event. Grigsby anticipates that several anglers will settle on the same lake, same spot. “That’s going to be the hardest thing. You think you will have a bunch of fish to yourself, but six other boats come in and split it up with you, and you don’t have anything,” he said. A big hole in anyone’s lake-hopping strategy will be that the lakes’ connecting canals have a speed limit of “no wake.” Essentially, that’s a low idle speed. The upshot is that the lakes, although geographically clustered, are separated by up to 30 minutes of travel time. Thus making multiple moves would call for very sharp time management. 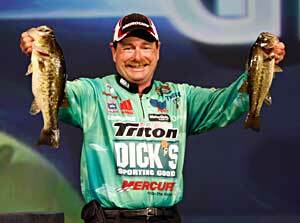 As Grigsby explained it, the pros will make their choices at launch time on Lake Dora in host city Tavares. Those who elect to stay in Dora could gain fishing time on those who head out for a 30-minute ride at idle speed to Eustis, one of the largest lakes in the chain. To get from Eustis to Harris, another larger lake of the chain, there’s a 15-minute crawl on the connector called Dead River. Getting into Griffin Lake from Eustis involves another canal ride, plus a lock-through. Electing to fish any of the tournament’s smaller lakes — Beauclaire, Carlton, Denham, Horseshoe, Little Harris and Trout — can be productive, but there’s less water to go around if a sharing situation arises. The weather is always a potential game-changer. Grigsby reported a chilly Monday morning. The forecast calls for warming in central Florida on Tuesday and Wednesday as practice continues. Then the pros can expect another change for the first competition day, Thursday: thunderstorms. In another possible shift Friday through Sunday, the anglers could find themselves fishing under bluebird skies with highs that touch the upper 70s. Grigsby said most of the big spawners have already come to the beds, but he’s still optimistic about big bags on a postspawn bite.